A Java 8 JRE/JDK is recommended. This sections guides the end-user through the use of Capella. Samples examples of Capella projects are provided to familiarize yourself with the concepts manipulated in Capella, the different engineering phases of Arcadia, and the good practices on how to model your system of interest through efficient means and ergonomic facilities. Download Capella on the download page. 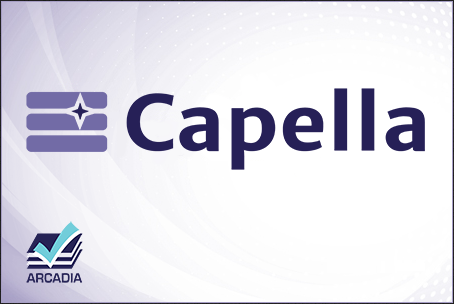 Then, please read through this guide that provides instructions for installing Capella. Some add-ons to Capella can be installed to provide additional features (team work, documentation generation, etc). The wiki has also a dedicated section for the addons and viewpoints for Capella and their installation. If you need help about the Capella workbench, you can post questions on the forum or contact professional experts. 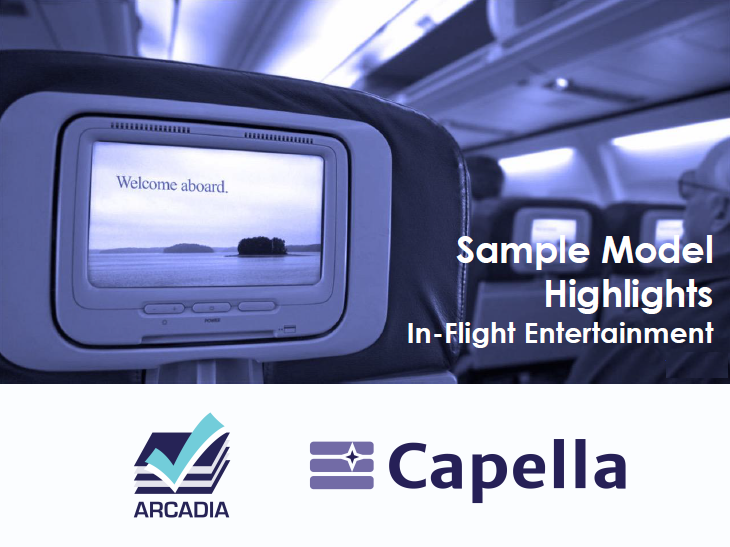 The Capella IFE sample model is an overly simplified vision of what a real in-flight entertainment system is. It is partial and mainly designed for educational purposes. For any question about the model (tool- or method-related), please post a question in the forum. The model is available for download here. 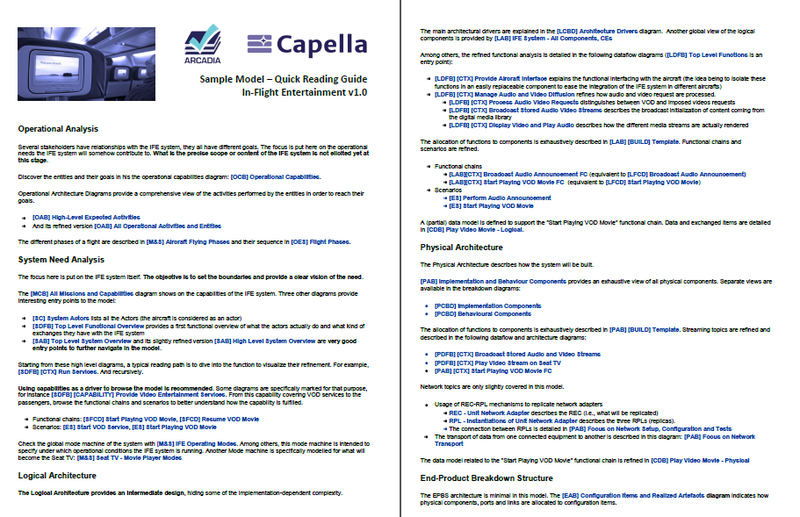 The Alarm Clock sample model is a set of slides illustrating precisely, step-by-step, how to use Capella to build a model. At this stage, it describes Operational Anlaysis, System Need Analysis and Logical Architecture. For any tool-related question about the model, please use the Capella Forum or consult the PRFC website. 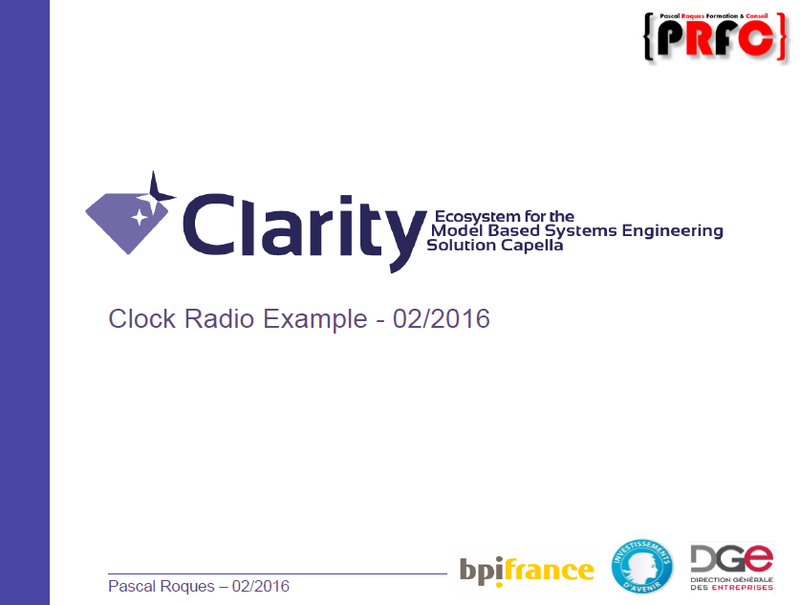 French translations of the Alarm Clock sample documentation and associated Capella model are also available.